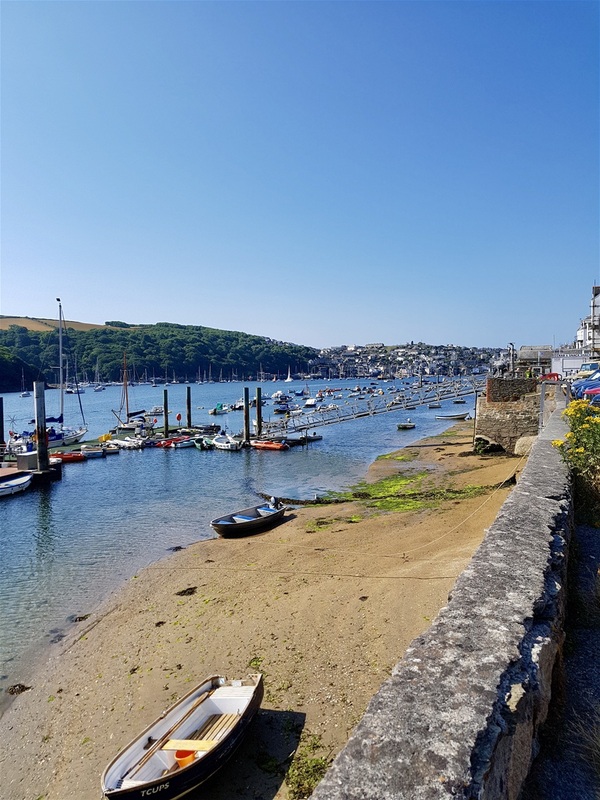 Fowey is very crowded, ruinously expensive, but is irresistible to sailors and literary types. Oh, and it’s very, very pretty. 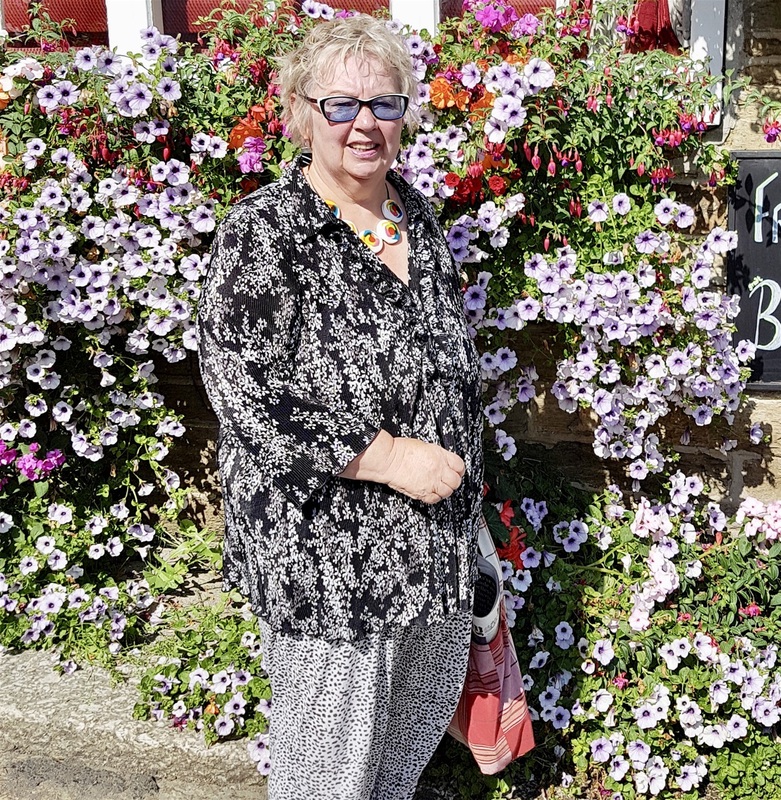 Went out quick with Eddie the borrowed dog and will never buy off Internet again, but no matter what the sandals are like when they eventually get here I will say they are wonderful. They were only £60. No, really £20. Why is life so difficult? I will have to wear wellingtons with the front cut out for the next five weeks. Really LOUD Americans in supermarket yesterday. I interrogated them immediately. Rammed them into the yoghurts with my trolley so they couldn’t escape. They are from California, staying with rellies, and of course LOVE the beaches, and the walks are just the BEST. If I had asked them where they were they wouldn’t know, or say CORRRNWAAAL. Very, very loud and that was just me. Woman on TV has just said to check on old people. So will have to check on G and get him hydrated. Wonder if he’ll cut that bit out when he checks the spelling, punctuation and other things I don’t bother with. Some top tips to survive a heat wave. I follow all these tips. Drink plenty of water, stay in the shade and don’t put a 15 tog duvet on the bed or use a hot water bottle. Also drink your wee. 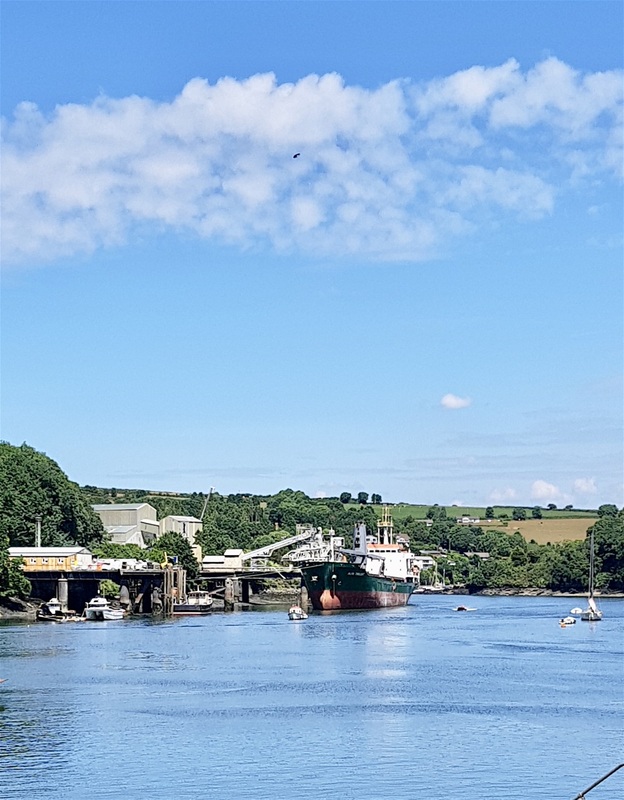 We decided to go to Fowey, which is pronounced Foy not Fow-ee, which I always find annoying. Why not call it Foy in the first place? Anyway, annoying name or not, it’s one of the most expensive places to buy a house in England, so only celebs can afford to live here. 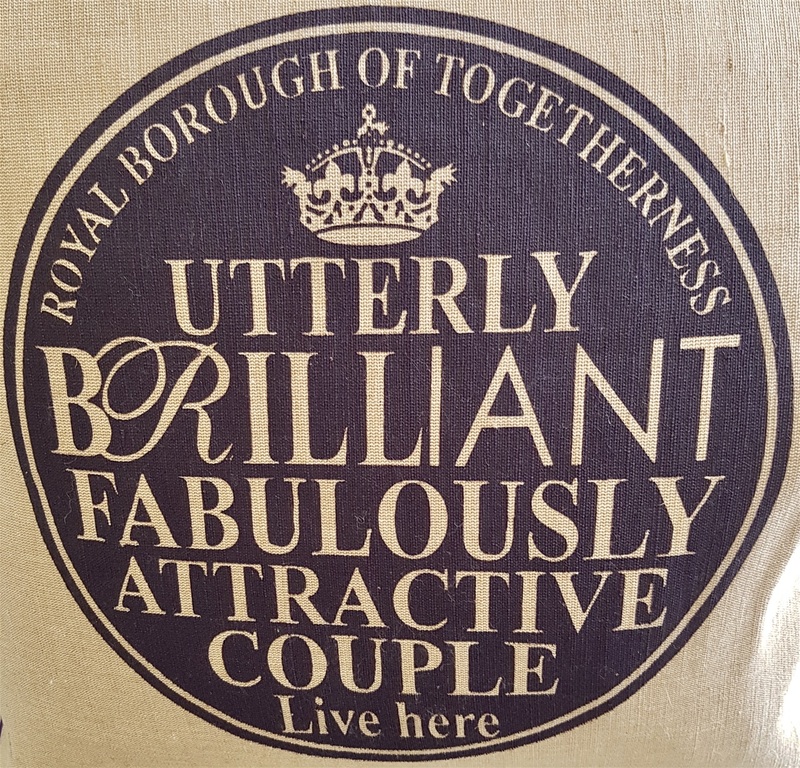 I was chatting to a local - ‘ow you today, my lovely?’ – who told me I’d just missed Prince Charles and Richard and Judy had been seen in the paper shop. It turned out to be true as someone else told me the same thing half an hour later. 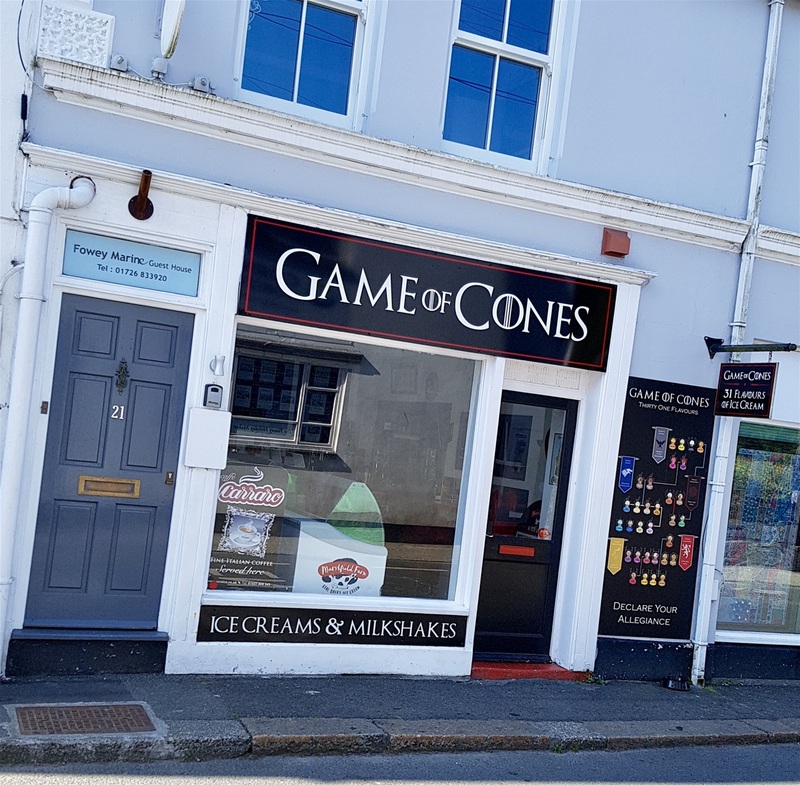 That next person said Dawn French had been in town a lot recently, but they couldn’t be certain what she had been buying. 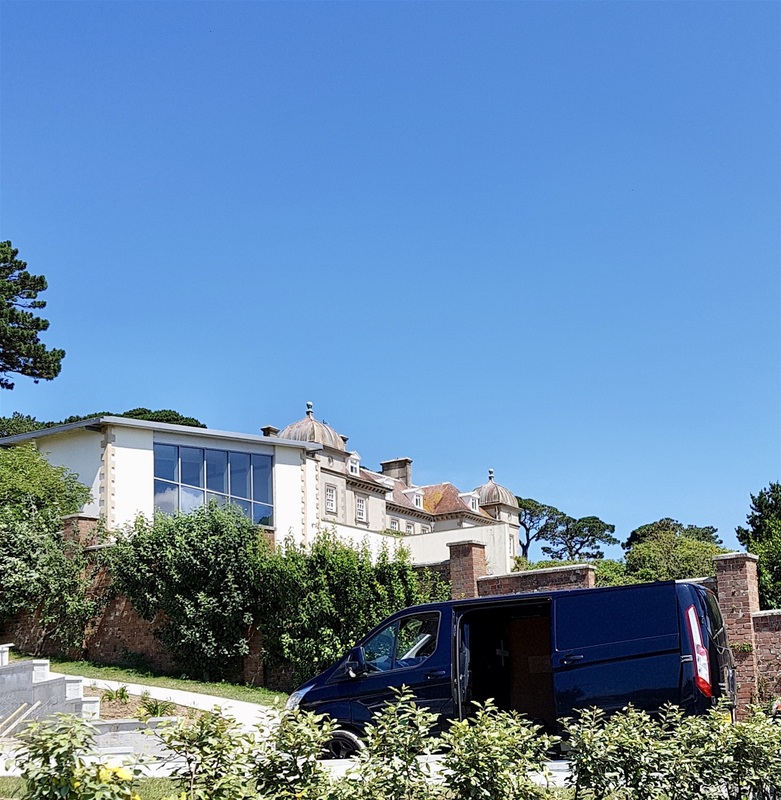 Gordon Ramsey and his wife visit Foy quite often as they have been renovating a former bank to use as a holiday home. Oh, Gloria Honeyford, don’t forget her. She has a house just down the road. It isn’t really two miles out of town, but on a hot day it seemed like it. We had a cool drink, inside as all the outdoor seats were taken, at a café on the quay and two lovely local girls were working as waitresses. The boss mustn’t have been in today because they both stopped to chat every time they passed. Someone had ordered breakfast for six people earlier on, then walked away two minutes later so the kitchen had cooked six full breakfasts and the customers had gone when the girls took it to the table. It made everybody very cross, then twenty minutes later one of the party of six came inside and said, ‘how much longer will our breakfast be?’ They had only moved round the corner, into the shade! G found a different way to get to the top of the town and we went to look up there, in the car, later. We could have walked up there, but that’s a well known symptom of madness locally. There are some lovely houses up on the hill, we parked outside Dawn French’s house, but she didn’t invite us in. It’s a gorgeous area around here. No wonder houses cost so much, but the roads in Foy are very, very narrow. I wouldn’t ever want to drive through it. Even G wasn’t keen when we did drive through once and he’s driven through, London, Paris, Florence, Rome, Marrakesh, all those places where I close my eyes for the whole journey. Even without going through the centre today we were glad we were in Ruby as she’s much thinner than our other car and every car we met going the other way seemed to be a Range Rover, which are not thin at all. Over to G who knows lots of things about Foy, mostly to do with famous writers and I’ve never read anything any of them wrote. If they didn’t used to be in Vicar of Dibley, they mean nothing to me. 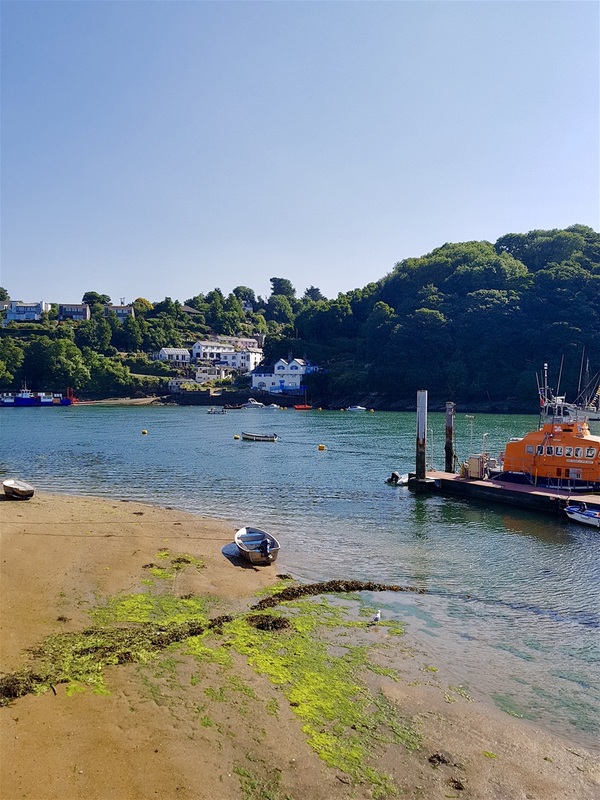 We parked the car in one of the few places in Fowey where we could access the town itself, more or less on the level. There’s another car park high above the town, but it was a very hot day and neither of us fancied the trek up the Cornish Version of the Eiger that the return trip would entail. 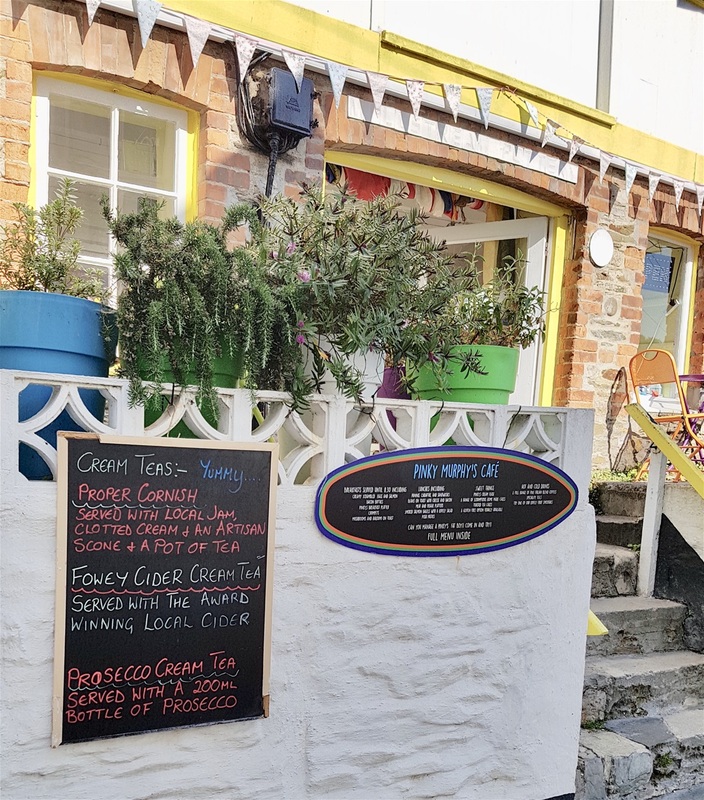 Fowey is best approached as a pedestrian as the roads are narrow. How narrow an unwary driver will soon discover when meeting a procession of commercial vehicles heading in the opposite direction with sides scraping against the buildings on both sides after supplying shops and restaurants. That was our experience the first time I drove into town and as I’m not a fan of constantly engaging reverse gear, we were happy enough to park on the outskirts and walk in. The houses are mainly Georgian – architectural shorthand for impressive – with many grand properties on the hillside and an assortment of pastel coloured cottages overlooking the river. 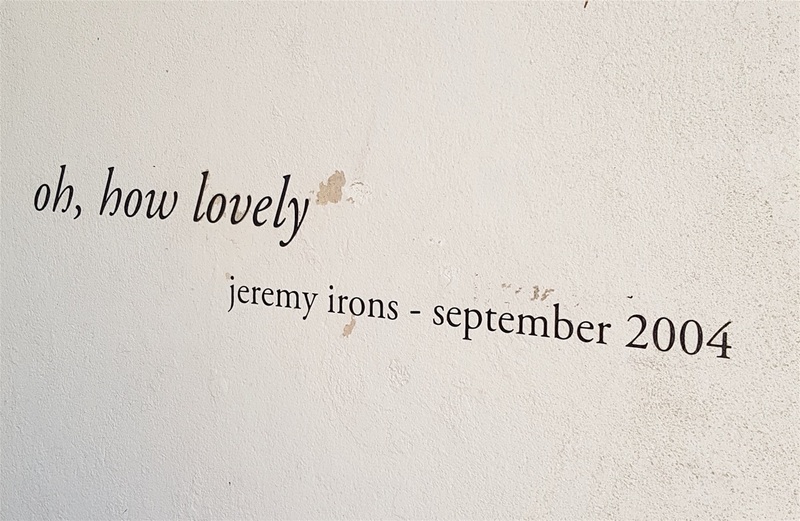 Fowey has always been a pretty place. 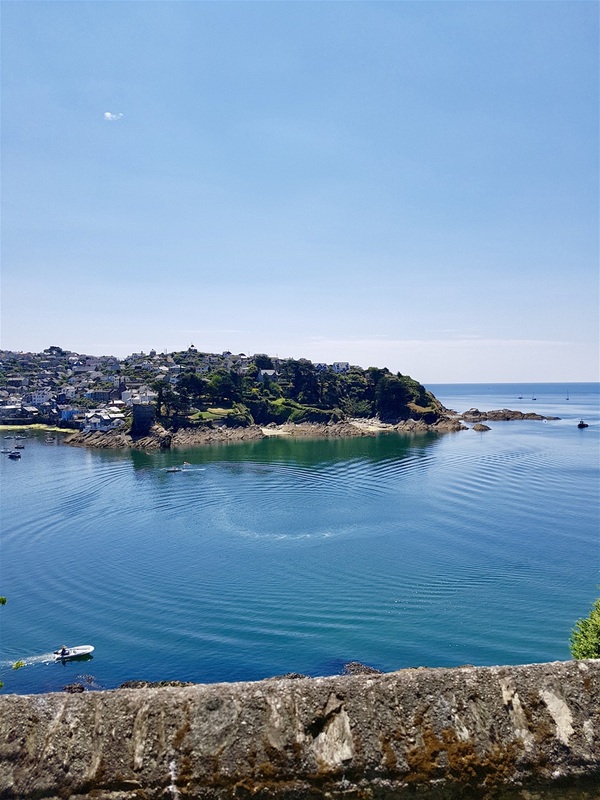 Queen Victoria referred to ‘some of the narrowest streets I ever saw in England’ and the ‘perpendicular hills,’ but readily acknowledged Fowey was ‘very pretty’. 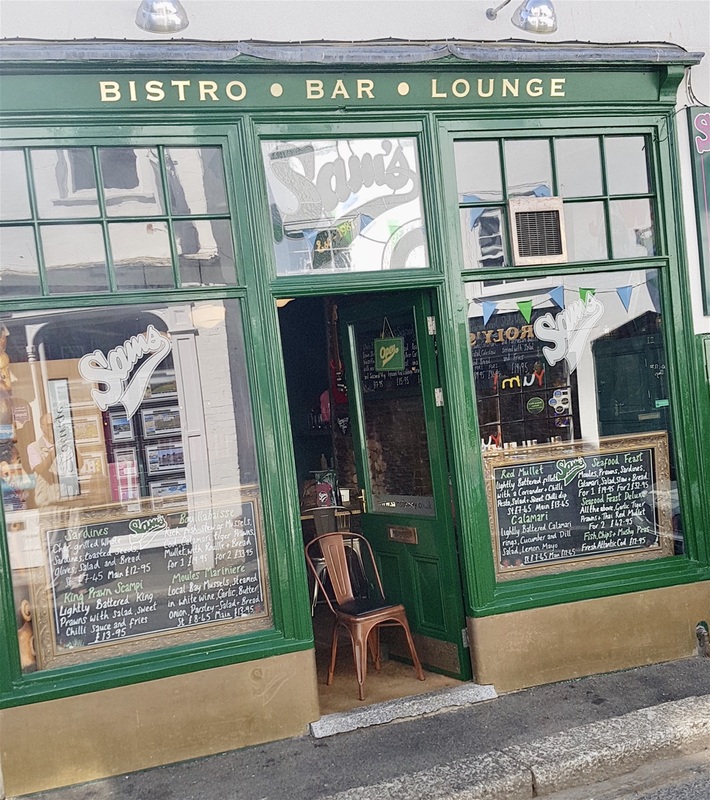 The poet Robert Bridges said Fowey was ‘the most poetic-looking place in England’ and J M Barrie, who wrote Peter Pan, said ‘it is but a toy town to look at, on a bay so small, hemmed in so picturesquely by cliffs and ruins, that of a moonlight night, it might pass for a scene in a theatre’. Quite a lot to live up to then. Lucy: ‘But, I can’t help it’. We laughed, along with Lucy’s mum. 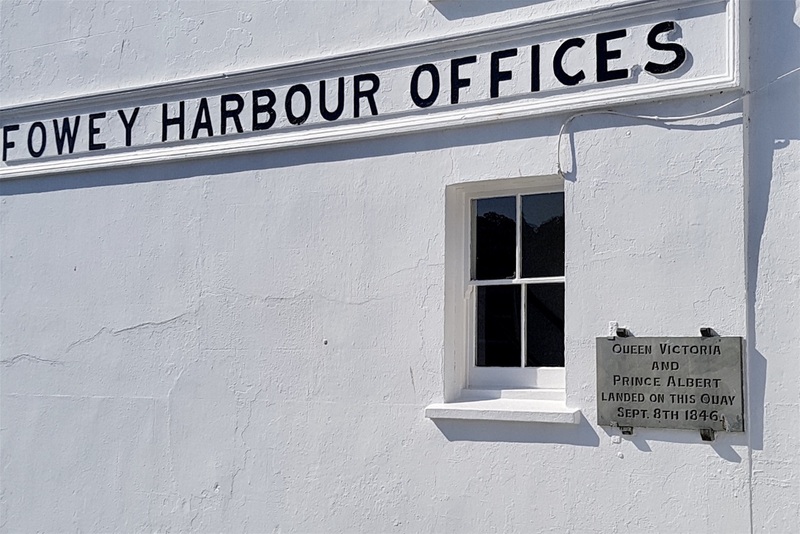 We passed Fowey Harbour Offices and the quay where Queen Victoria and Prince Albert landed on their visit to the town. 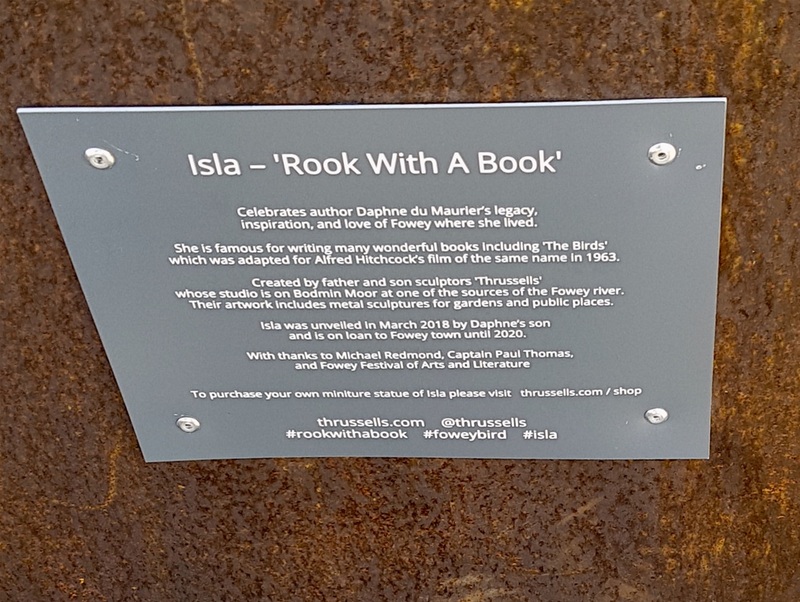 Alongside is a striking sculpture, Rook with a Book, inspired by local author, Daphne du Maurier’s book The Birds and transposed into a memorable film by Alfred Hitchcock. 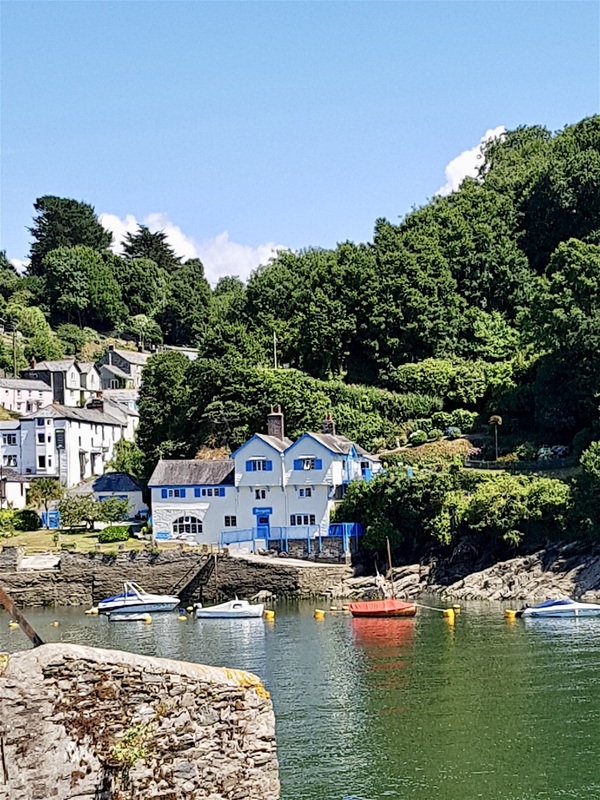 Fowey and Daphne du Maurier are irretrievably linked and across the river we see the blue and white house, Ferryside, the holiday home where she wrote her first novel. She lived for most of her life at nearby Menabilly, a relatively isolated grand house in the countryside which was the inspiration for Manderley in her best-selling novel Rebecca. 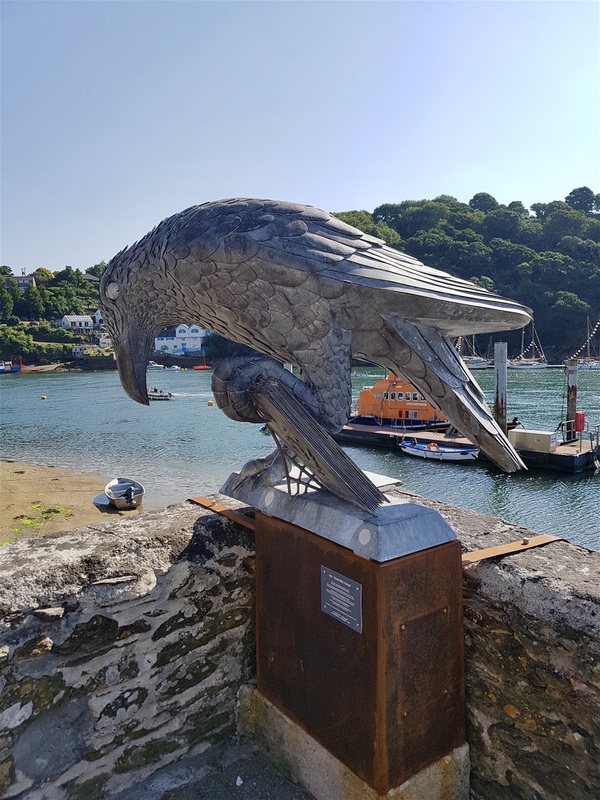 Daphne du Maurier died in 1969, but a du Maurier Festival is now an annual event in Fowey. 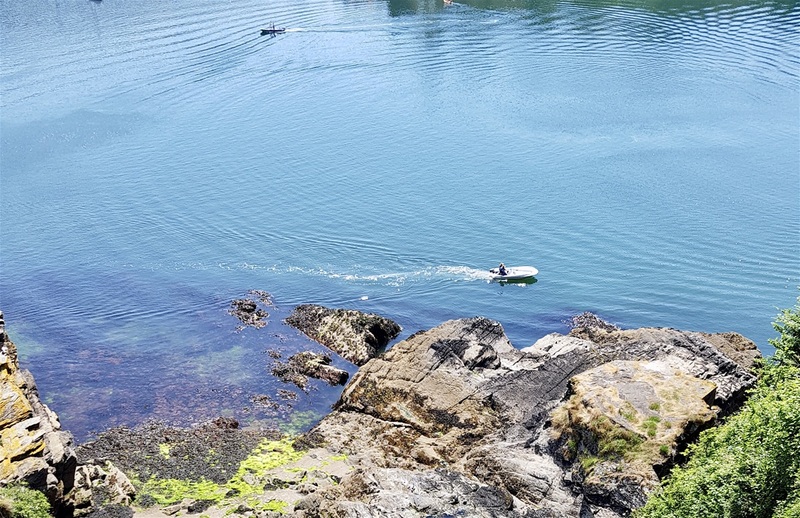 From her first days in Fowey, Du Maurier felt that ‘the place has taken hold of me,’ writing ‘ships anchored, looming up through blackness ... the splash of muffled oars’ in her diary. (I read this extract in the local bookshop and committed it to memory). She should have been a writer! 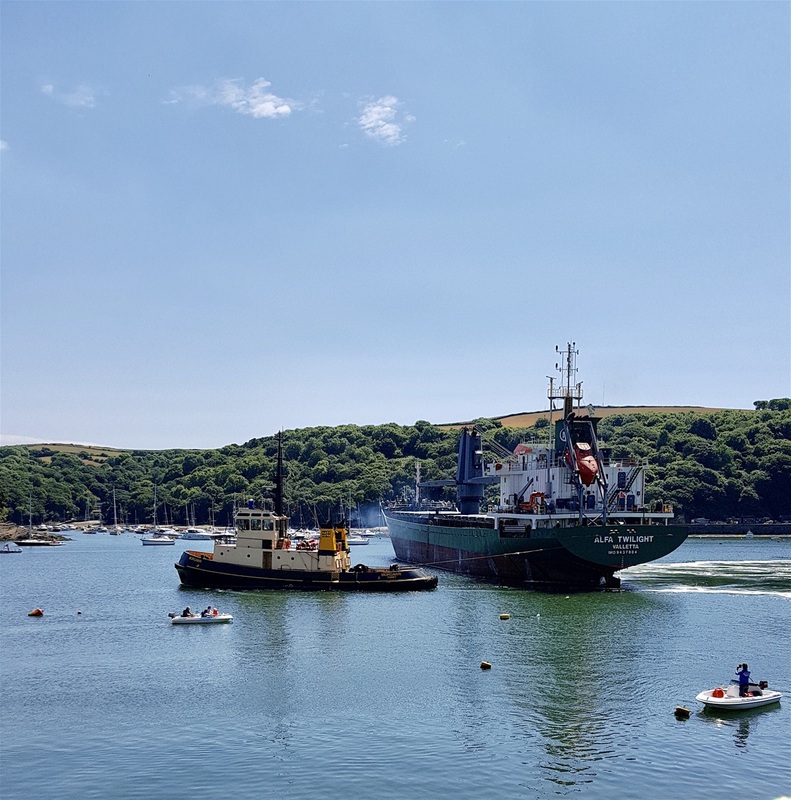 Fowey is very much a ‘boat town;’ dozens of craft in view today, ranging from tiny skiffs to larger yachts and the odd freighter bound for the china clay wharfs being manoeuvred into place by tug boats. 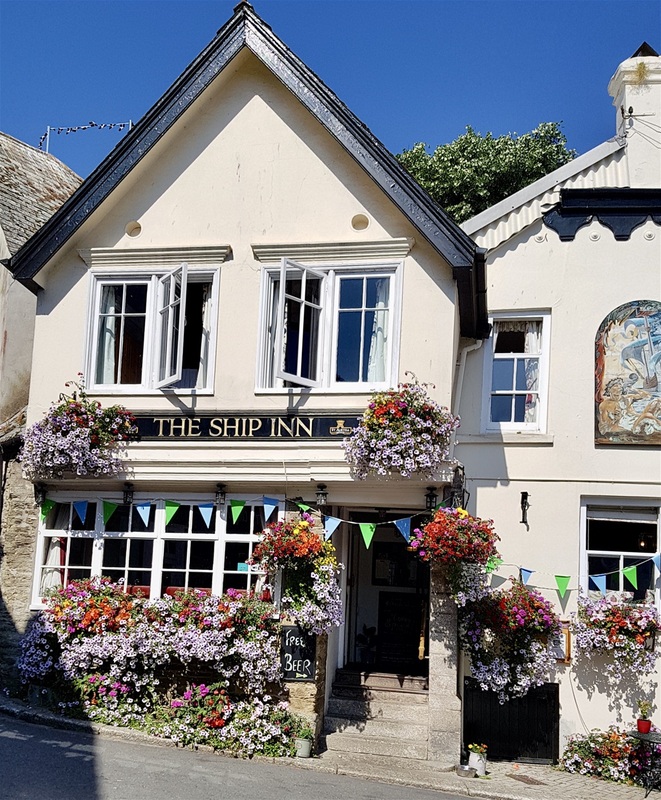 Ships left from here to join battle against the Spanish Armada and supplied boats for the D-Day landings; its maritime history spans the centuries. 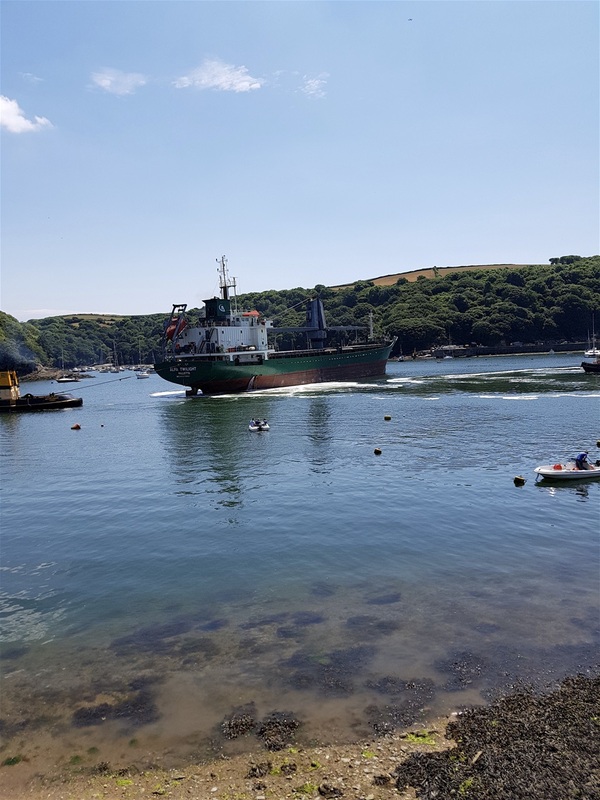 Nowadays, ferries shuttle to and fro across the water, carrying cars between Caffa Mill, near where we are parked, and Bodinnick, and foot passengers between Fowey and Polruan, the village on the opposite headland. We reach the main quay in the town centre and decide to have a cool drink then wander the narrow streets to look at the shops. It’s only a small town, easily walked around, but the hill looms above and we congratulate ourselves on not having to make the journey up to the top car park. 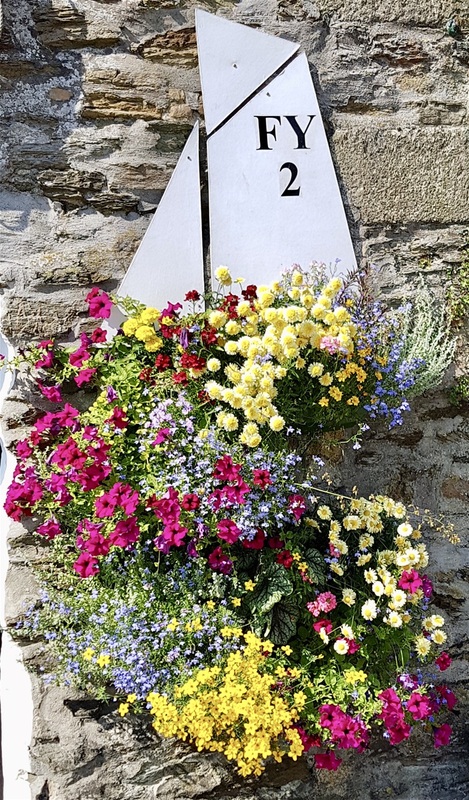 We passed Fowey’s oldest building, the Well House, which was built in 1430 and is now a B&B and a hand painted sign on a wall reading ‘oh, how lovely,’ - Jeremy Irons’, which I am unable to reference, but I like it. The cafes on the Quay are packed with customers, but we find a spare table inside. Our waitress immediately decides Marigold has just come in for a chat – an easy assumption most days – as they instantly start up a conversation. The girl is 17, Marigold, er, isn’t 17, but there’s no sign of an age barrier. When I could get a word in, I asked the waitress what they had in the way of a cool drink. Fascinating, this example of the constant evolution of language; this latest word, like so many other new words, emanating from popular culture. I approve. 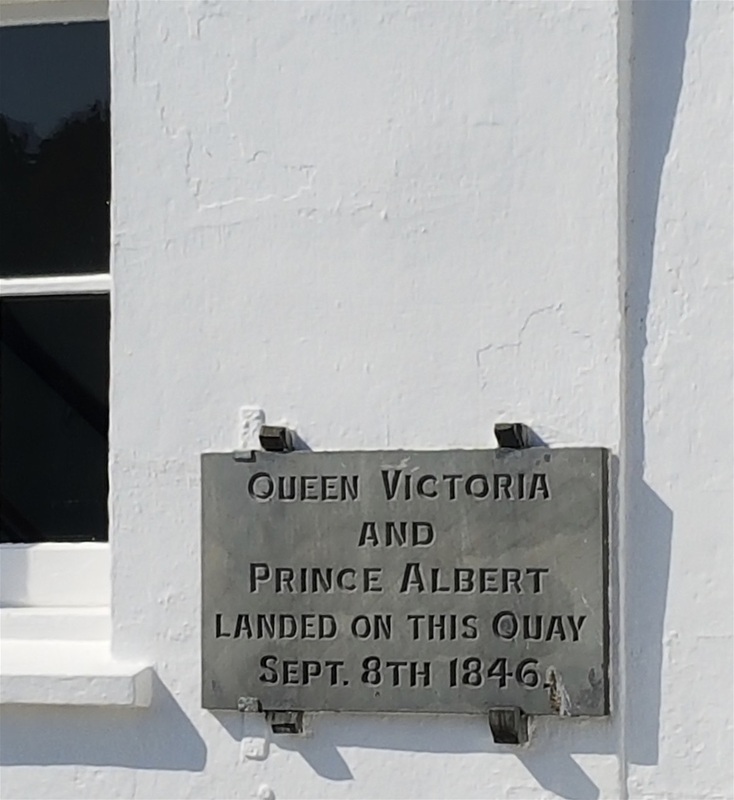 I’ve no particularly fond childhood memories of The Wind in The Willows, but Kenneth Grahame formed a great attachment to Fowey, even celebrating his marriage there, during frequent visits to his great friend Sir Arthur Quiller-Couch. Quiller-Couch, usually referred to as simply Q, was apparently the inspiration for the talkative Ratty in Wind in the Willows. Q was a remarkable man of letters. Without intentionally disparaging Kenneth Grahame or Daphne du Maurer, we’re talking chalk and cheese here. ‘Q’ is perhaps best known for producing not one but two remarkable anthologies: The Oxford Book of English Verse and The Oxford Book of English Prose. On his death an unfinished novel, Castle Dor, was discovered and subsequently completed many years later, by Daphne du Maurier. Keep it in the Fowey family! My interest in Q is derived from a fragment of his advice to authors, ‘kill your darlings.’ Basically, he’s suggesting if a writer becomes self indulgent, reads a passage back and is overly pleased by it, cut it out, immediately. ‘Darlings’ are those words or phrases that give the writer pleasure, but may add little to the eventual reader. Cut them out. Kill them. The hardest task for any writer and the most important. Even so, back when I was on the professional writers’ treadmill, deleting those sections of prose which caused me to pause and (erroneously) consider my own literary greatness was difficult, but oh so necessary. 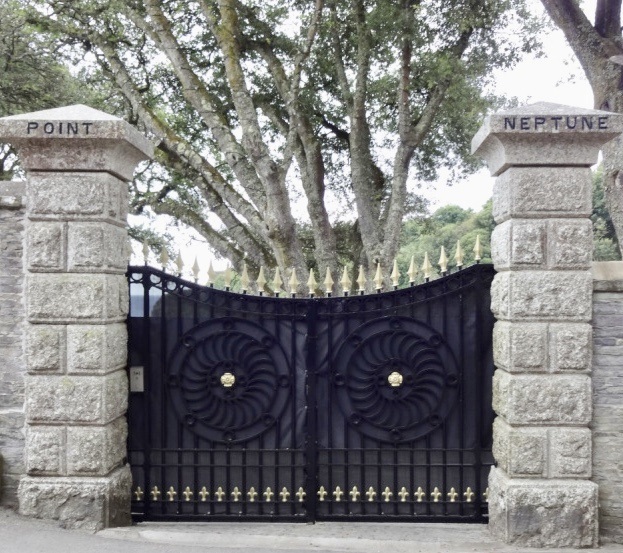 Port Neptune was bought by Dawn French and Lenny Henry in 2006 and although they are no longer together, she still lives there. A vulgar reader would doubtless ask the price. Okay, £2.8 million, but don’t expect a repetition of this descent into Hello territory. A lot of money in 2006, especially as it needed a total ‘refurb,’ but you get 40 bedrooms so it’s not pokey. 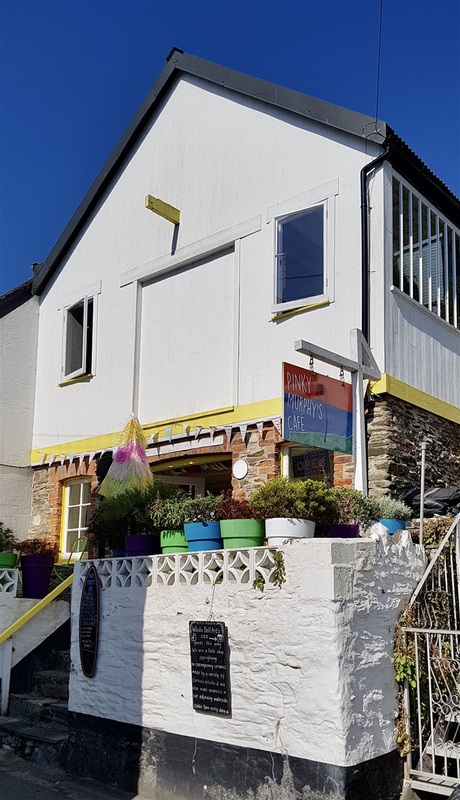 A local woman in the bookshop had already told me of the property being advertised at the time it went up for sale as being, ‘next door to the house where Daphne du Maurier once lived,’ Readymoney Cottage being much more famous than the estate house on the hill to which it once belonged. We found Readymoney Cove and the former coach house to Point Neptune where Daphne du Maurer once lived, if only for a short time. 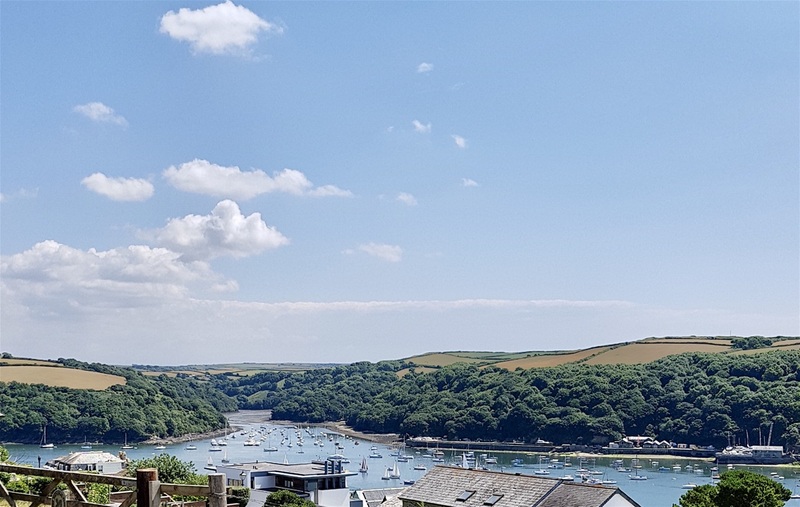 It was recently sold, for over £2 million which puts the price of the far larger, but substantially less pretty Port Neptune looming above it into perspective. 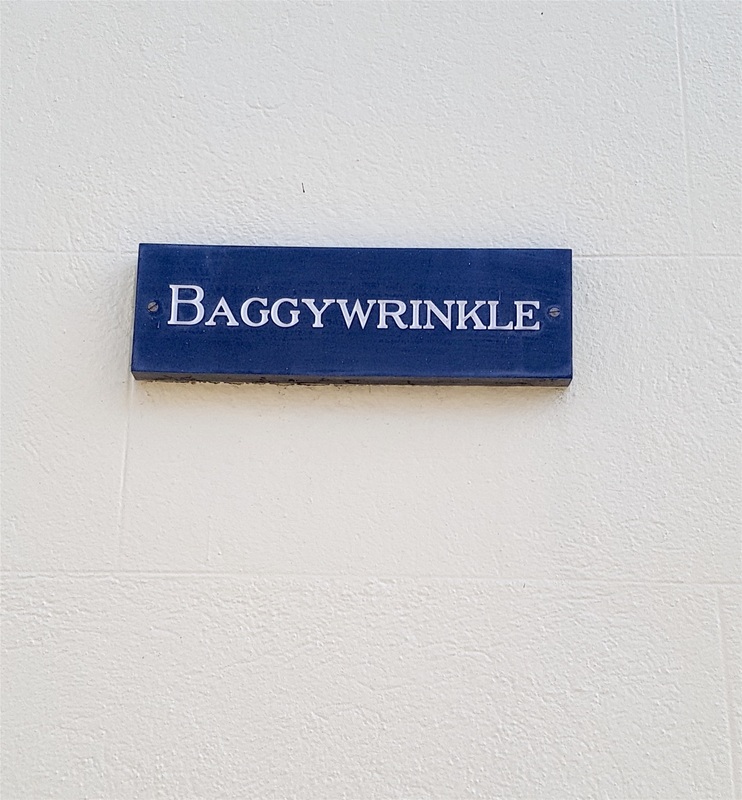 This is a pricey area and no mistake. One more thing, as the late Steve Jobs used to say when unveiling Apple’s latest technological marvel. We were in the company of some people the other day who I can best describe as being not our first choice as conversational companions, but some things are unavoidable. One of the youngest members of the group was particularly tiresome: rising inflections at the end of every sentence, constantly flicking at her hair, laughing loudly in an attention seeking manner, you get the general idea? One of the many annoyances, right up there with fingers either side of the head indicating quotation marks when no quotation was involved, yes she did that too, was an apparent compulsion to add ‘hashtag (add random word, usually one without any relevance to the previous words) at the end of every sentence. I took to saying ‘octothorpe’ plus an unrelated word or word combination at the end of a sentence, octothorpe being the word that describes the symbol #. Nobody even noticed. Not on our house, but it should be! Gates to Dawn French house, all 40 bedrooms of it.